Happy Monday friends! Hope you all had a great weekend! I had a fabulous time working on some projects, spending time with a friend who came to visit and relaxing at the beach 🙂 Can’t get better than that! So if you follow me on Instagram, you may have seen the photo I posted on Saturday of a little something I was working on. A couple of you guessed it was a headboard, which of course put new ideas in my head, but I’m here to reveal to you it’s true identity! As many of you know, or if you’re new around here, we rent a little apartment with not much natural light. Our living room is also painted a not so pretty brown that I just never put the effort into painting. I’ve never been truly happy with any place in our apartment that I stage my photos, yes I’m probably being too picky, but I can’t help it! So when my blog got it’s new look last week, you may have noticed the wooden background, which I LOVE. This got me thinking…why don’t I make a wall similar to the background and use it as a backdrop to take my pictures against! BRILLIANT! At first I thought about making it out of pallets. I scrounged up about 4 of them and totally forgot about how much of a pain they are to take apart. The hubs has a broken pinky right now and isn’t very useful so I recruited one of my friends to come over and help me. 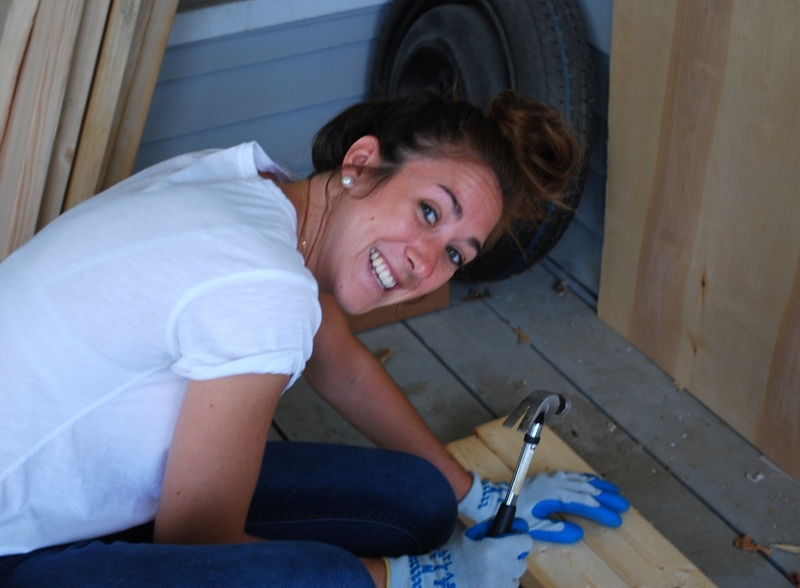 With hammers and crowbars and a lot of sweat, we got most of the wood off of 3 of the pallets. Taking a look at the pile, I knew it wasn’t going to be enough, and really didn’t want to deal with taking more of them apart. I’d gone to Home Depot and looked around for wood there but really didn’t see anything that would work for what I wanted. I ended up going to a local lumber yard and explained what I wanted and placed an order. I probably should have asked to see the wood first because when we went to pick it up later that day, I realized they’d given me 2x4s. Just a wee bit thicker than what I needed. The hubs was not amused. I’d already payed for the wood and at this point I just wanted to get this thing built. We loaded up the car and headed home to start building! Since this was just going to be leaning up against a wall, it didn’t need to be super sturdy. 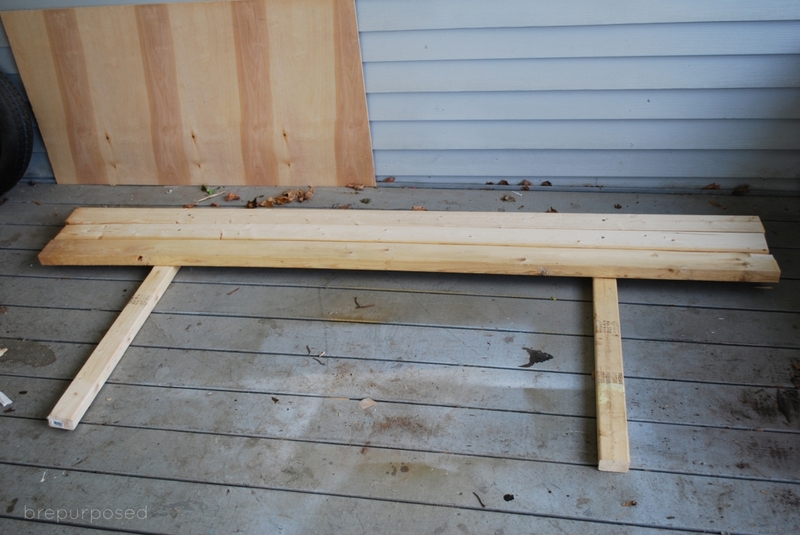 We used more 2x4s as the support beams and simply nailed the others as shown in the photo. To achieve the distressed look the next step was to stain. I used Minwax’s Dark Walnut. I actually really like the way it looked stained, but that wouldn’t match my blog’s background, so I carried on. I grabbed some white and light grey paint that I had laying around and a large paintbrush. Using a VERY small amount of paint on the brush, I lightly brushed it on. I did about 3 coats and was planning on doing some extra distressing with a sanding block, but it was just taking the paint off so I left it as is. And that my friends is my new pride and joy! It turned out even better than I imagined and hopefully now everyone will understand why I wanted to build a wall 🙂 It may not match my background exactly but I’m ok with that and can’t wait to have my own little photo studio. Even if it is on our front porch 🙂 Neighbors DEF think I’m a crazy person. I need to put this on my “to do” list! I really like this! What are the rough dimensions of the wall I am trying to talk my wife into letting me build one of these for her side business. This is such a great idea and such a smart use of space! I have a small house and I’m always having to move things out of the way for pictures. I am adding this to my ‘must-make project’ list and pinning. AWESOMENESS! Thank you so much Mary Beth! I can definitely relate 🙂 Thanks for sharing! I love how this turned out Bre! It’s such a great way to decorate when you’re renting. Thanks so much for sharing this at Frugal Crafty Home Blog Hop–this is going to be one of my features at our next party! I so need one of these in my life! It’s gorgeous!!! Love it! How did you get the new 2x4s to have not straight edges (it looks like the unfinished ones have some character on the sides)? Looks great! I love pallet/wood backdrops! 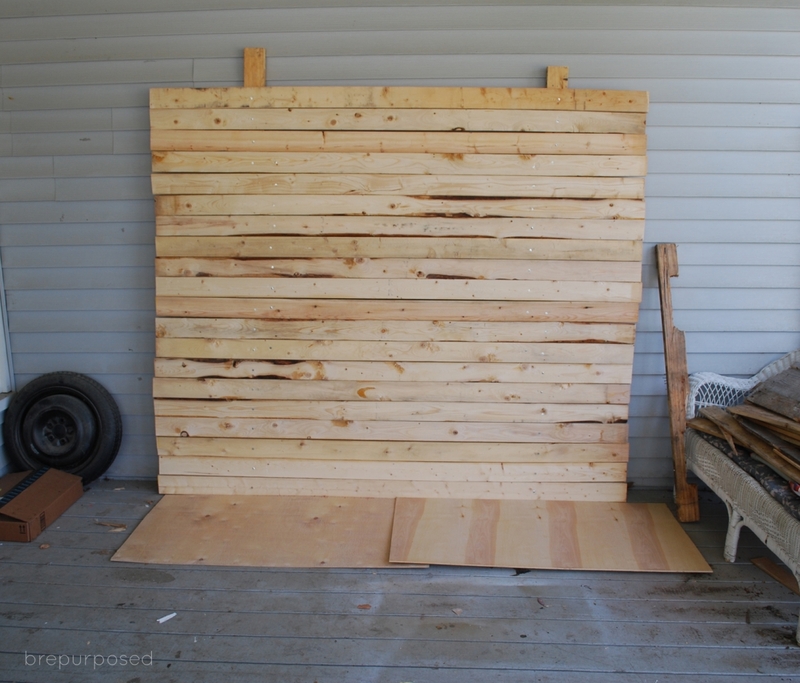 And pallets ARE a pain to rip apart, I did an accent wall in my son’s room adn it looks awesome, but it took a LONG time to collect and take apart all those pallets! Thank you! Oh my gosh, yes they are a pain! Good for you for sticking to it and doing a whole wall! Beautiful! I’m pinning this and adding it to my (ever-growing) to-do list! Wow! What an incredible finished piece. 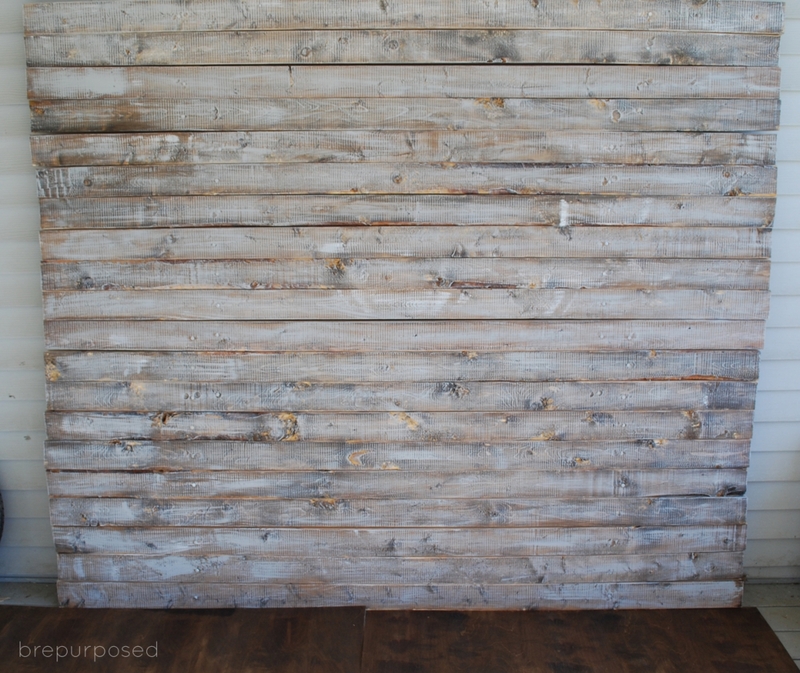 The combo of staining and white-washing gives it such a weathered vibe – – I would have never guessed that this wasn’t reclaimed wood. Well done, my dear! Looking forward to seeing this action in your blog photos to come! Aw thank you so much, Lauren! It turned out even better than I expected and was so easy to “distress” 🙂 You’ll be seeing lots more of it around my blog! Looks fantastic. I really like how it came out when you “distressed” it. Thanks Nicole! I tried to match it as close as possible, good enough for me! that is awesome! I’m pretty sure our last neighbors thought I was crazy too. I’ll do anything for the best light and inside just doesn’t cut it sometimes. I definitely need to make one of those. 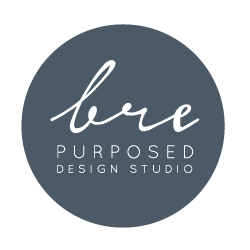 So happy to just find your blog, I love it everything about it! haha I know right?! My husband thinks I’m pretty crazy too, but you gotta do what you gotta do! So glad you stopped by and thank you for the kind words! This looks so good, Im really into the wood look. Hey it even matches your blog background! I need to make one of these ASAP!! 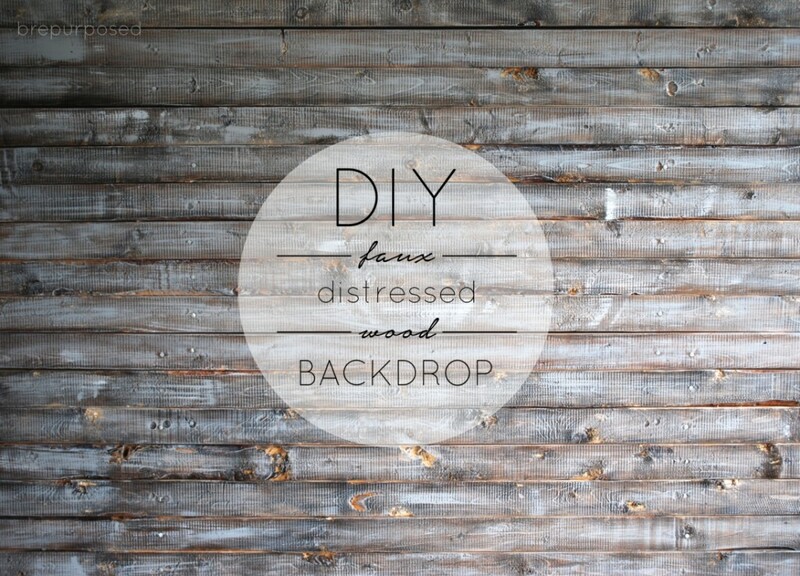 I love the look of distressed wood and it would make one fabulous backdrop!! It certainly does, I’m loving it!! This is AMAZING! I might steal this idea to make a new blogging backdrop! So, so awesome. Thank you SO much Kelly! Feel free to steal my idea 🙂 I’d love to see yours if you do! P.S. What is the social media challenge for #SITSblogging?! Oh awesome!! I’m so glad it brought you to me! I’ll have to check it out 🙂 Thanks for heads up! Wow! You go all out! 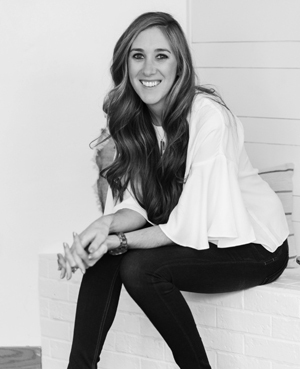 I love the new background on your blog too … it all looks so nice! I thought I was doing good with a piece of white fabric taped to my wall and draping over the top of a shelf for ebay pictures;0) Classy, eh?! haha thank you so much! go big or go home right?! Thank you Christina! I wanted my photos to look consistent and since I sell most of my pieces anyway, I figured a little backdrop would be perfect! SOOOOO pretty!!! I’ve been dying to try my hand at some whitewashing! LOVE, LOVE, LOVE how it turned out!!! I love this! I want to create something like this for my baby’s first birthday. I’m planning on a rustic camping theme for his first. What kind of wood did you use and about how long did it take you to complete? I would appreciate any tips and information. Thank you! Hi Hara! That sounds so cute! I used 2x4s for mine but it made it super heavy. I would probably recommend something a little more lightweight for what you want. 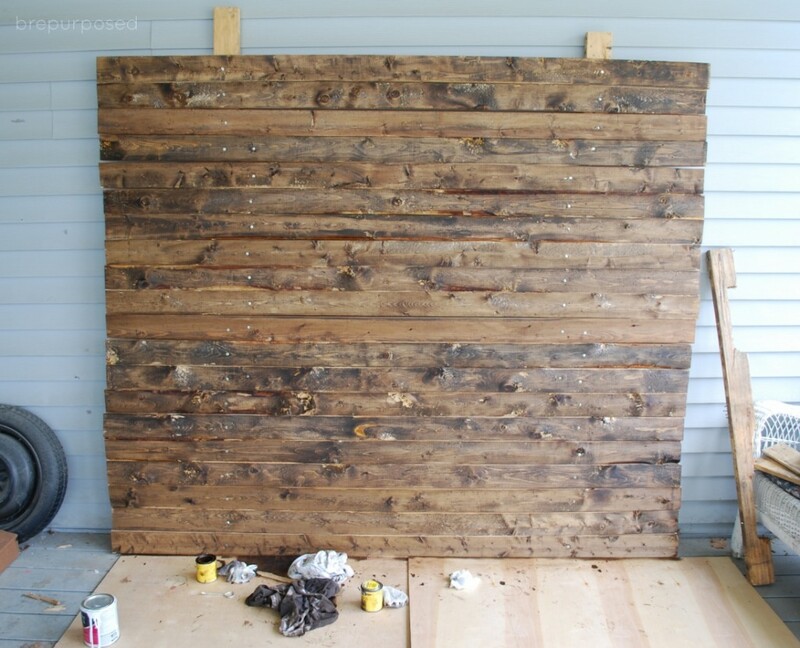 You could get a piece of plywood cut at Lowes or Home Depot to the size you want and then use strips of balsa wood that you can find at the craft store which are super light to get the look of the panels. That might be a good option for you!